To avoid diminishing the station’s character, do not alter the site features (taking rocks from the beach), which are important in defining the overall historic character of the property. 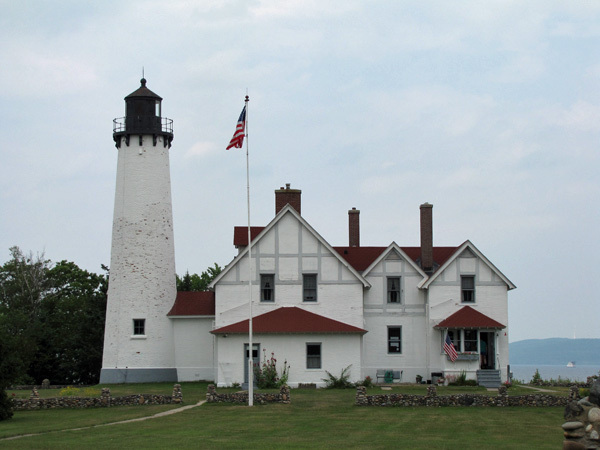 Do not remove or relocate historic light station buildings or landscape feature (rocks from the beach), thus destroying the historic relationship between the lighthouse, the buildings and the landscape. I guess that the prohibition against relocating rocks from the beach could also include the time-honored practice of throwing rocks into the water. If this prohibition is just going up now at Iroquois, I wonder how much longer before the Whitefish Point lighthouse follows suit? Oh by the way, when I rode to the lighthouse with Anne, earlier this summer, I noticed a small sign just outside the burial grounds. It said that the use of metal detectors in this area is prohibited. The lighthouse keepers log books often mention vessels delayed or stuck in the ice at the start of the spring shipping season. 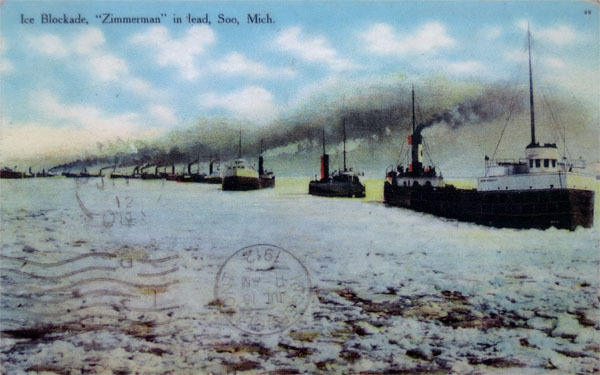 This postcard shows ore carriers in a Whitefish Bay spring “ice blockade” around 1910. The above photo and the following picture are both displayed on placards in an informational kiosk. The ship Cliffs Victory was originally built in 1945 as a WW II “Victory ship”. 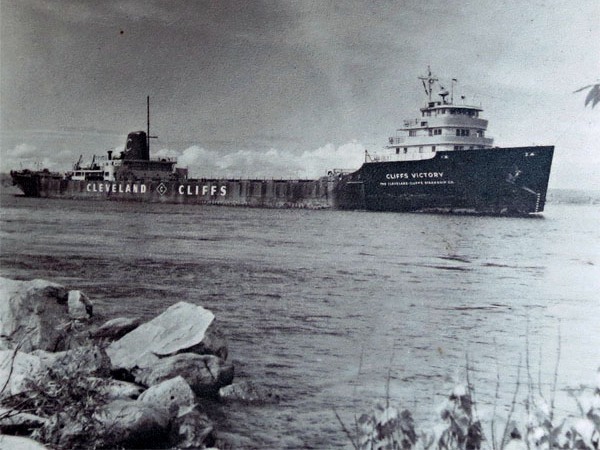 She was later lengthened and reconstructed for Great Lakes use in 1951 and for a while was the fastest bulk freighter on the lakes. It was eventually dismantled for scrap iron in Korea, in 1987. This entry was posted in Bicycling, Biking, Cabin, Family, History, Life, Michigan, Photo, Photography and tagged The Cabin, Travel by RegenAxe. Bookmark the permalink. And I do know that I have taken my share of rocks away from that beach as well. What a miscreant I have been.